and will protect your mat for transportation. ALSO available for 18 x 36 mats!! These Cleanroom Sticky Mats Frames are a compliment to your tacky mat that provide a unique, COST EFFECTIVE solution to holding your mat in place. Without these frames you risk someone stepping on the mat and it sliding and creating a dangerous situation. These frames have a non slip grip material adhered to the back that will not allow your mat to slide on any floor surface. Once your Sticky Mat is attached to the frame you can pick it up after used and transport it easily. Unpack your frame and place non slip side of your frame on any flat floor surface. Center in the face up side (white side) of the frame and place the sticky side of your mat onto the surface of the frame and run your hand over the mat to make sure you mat is attached to the frame. 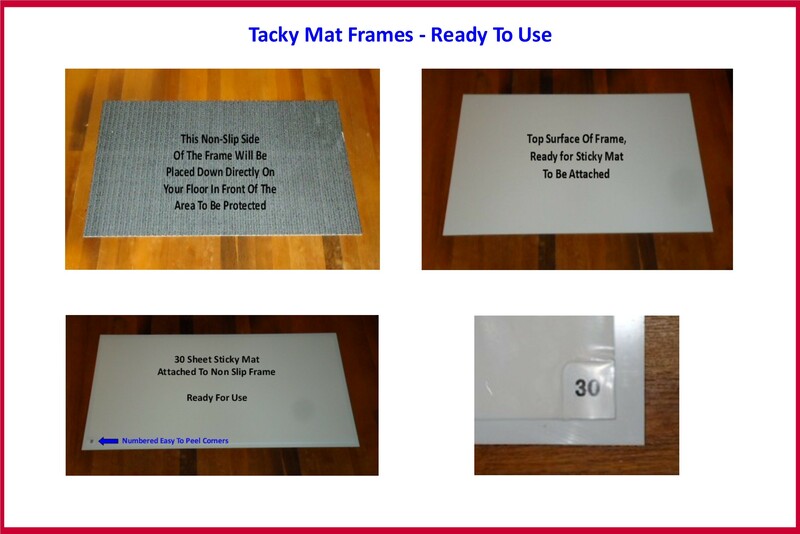 You are ready to use your Sticky Mat & Frame. When your mat no longer has the adhesive properties to hold dirt, peel back the top sheet and dispose, ready for use again, this can be done 30 times before you will need a new mat!! These frames are reuseable over and over, no need to purchase everytime that you purchase Sticky Mats!! These frames and mats are also great for homeowners that are trying to protect their finished floors or carpeted floors in their homes with very little effort.